Efficient transport by car, train, bus and ferryboat makes it possible to explore Normandy on day-trips from Paris, but it's far more enjoyable to spend several days and nights in this beautiful region. 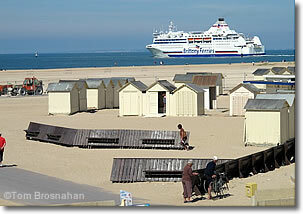 Normandy has highway and rail links with the rest of France and beyond to Europe; and sea links with England and Ireland. For more detailed information on the transport for any city or town, refer to that town's pages. TGV, Intercité and TER trains from Paris's Gare St-Lazare speed daily to Normandy's principal cities such as Caen, Cherbourg and Rouen, and to many of its larger towns like Bayeux (map). If you don't find a direct train to the Normandy town you want, you'll probably find a connecting TER regional train, or a district bus to get you to your destination. Car hire/rental offices are located at every large-town train station. Caen is probably the best place to pick up a car because it has good train service to and from Paris, and is close to the D-Day beaches and Bayeux. at Ouistreham (Sword Beach), north of Caen.